If you are on a senior care journey with an elderly parent you know how important it is to protect him from serious falls. You do not want him to be one of the 2 and a half million aging adults who will end up in the emergency room each year due to injuries that they sustained when they fall, or one of the more than 700,000 who will have to be hospitalized because of those injuries. No matter how much you do throughout your parent’s home to reduce his fall risk and how much effort you put into keeping him safe, the reality is that 30 percent of seniors will fall each year. This means that you are likely to encounter such a fall at some point in your senior care journey and it is important that you, and your senior, are prepared to handle such an event should it occur. Strengthen his body. Having a strong body is an important part of avoiding falls in the first place, but it also plays a role in preventing injuries. When your parent’s muscles are stronger they are better able to protect the bones and joints they surround. Being stronger also means that your parent will have greater control over his body, enabling him to fall in a safer way and guard himself as he falls. Increase flexibility. Many injuries that occur happen or are worsened because of lack of flexibility and range of motion. When joints are flexible and have as much range of motion as possible, your parent is better able to move with the fall and his joints are better able to adjust to the impact, reducing the chances of strains, pulls, and tears within the muscles and joints. Keep the head up. 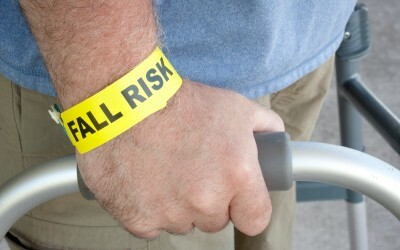 Falls are the leading cause of traumatic brain injuries. It is extremely important that your parent know how to reduce the chances that he will suffer this type of serious injury should he experience a fall. One of the key ways is to make an effort to keep his head and face up and away from the ground or other objects as he is falling. If this is not possible he should try to cushion his head such as covering it with his hands or arms to reduce the chances of a serious injury. Fall correctly. It may seem strange that there is a “right” way to fall, but the truth is there is. There are techniques that your parent can use when he knows that a fall is inevitable to help reduce the chances that he will suffer a serious injury. These include not extending your hand when you are falling. Though this is the natural instinct, it dramatically increases the chance of breaking a bone in the wrist or the arm. If your parent senses that he is going to fall, he should focus on getting as low to the ground as possible before falling, keeping his arms close to his chest and his head up, and rolling with the fall. Rolling rather than falling directly will reduce the stress on each individual part of the body, lessening the chances of serious injury. If you or an aging loved one are considering elder care in Manalapan Township, NJ, please contact the caring staff at Lares Home Care 1-800-781-7435 or 732-566-1112.